For Napoleon's stepdaughter, nothing is simple -- especially love. Paris, 1798. Hortense de Beauharnais is engrossed in her studies at a boarding school for aristocratic girls, most of whom suffered tragic losses during the tumultuous days of the French Revolution. She loves to play and compose music, read and paint, and daydream about Christophe, her brother's dashing fellow officer. But Hortense is not an ordinary girl. Her beautiful, charming mother, Josephine, has married Napoleon Bonaparte, soon to become the most powerful man in France, but viewed by Hortense as a coarse, unworthy successor to her elegant father, who was guillotined during the Terror. Where will Hortense's future lie? 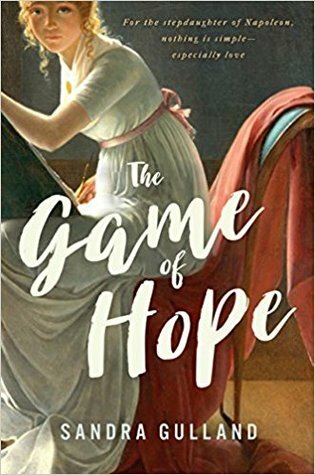 Inspired by Hortense's real-life autobiography with charming glimpses of teen life long ago, this is the story of a girl chosen by fate to play a role she didn't choose. I received a copy of this book through Penguin's First to Read program. This is my honest review. I wanted to like this book. I usually really enjoy historical fiction, but this book fell flat for me. I kind of feel like reading this book would be like reading Rob Kardashian's memoir if he was only famous because his mother married Bruce (now Caitlyn) Jenner. And I may have been more forgiving of the book if I'd remembered while reading it that it was based on Hortense's actual autobiography, but at the same time, I feel like I'd probably just rather read her autobiography. What I found in this story was a main character who is just completely full of herself. Sure, she implies that she gets so much satisfaction from helping others, especially the younger girls at her school, but it comes across like a person bragging about feeding the homeless or donating to charity. In addition to seeming full of herself, Hortense comes across as incredibly sanctimonious. She takes issue with her cousin Em because Em doesn't love her husband and while he's away at war, Em flirts with one of Napoleon's brothers. Meanwhile Hortense was scheming to try and get closer to a certain aide for Napoleon because she had a crush on him. She wanted to marry for love and couldn't understand why her cousin wasn't thrilled about her arranged marriage. There were just so many things about Hortense's attitude that rubbed me the wrong way and I just don't like her. And it's really hard to enjoy a book told from the main character's POV when you don't like the main character. In spite of my distaste for Hortense, there were some aspects of the story that I found intriguing. I found myself excited for scenes with her music instructor, Citoyen Jadin, kind of hoping that something would blossom there. I also found the family drama between Hortense's mother and the Bonapartes mildly interesting (but I enjoy reality tv so that's not too surprising). SANDRA GULLAND is an American-born Canadian novelist. She is the author of the internationally bestselling trilogy of novels based on the life of Josephine Bonaparte: The Many Lives & Secret Sorrows of Josephine B.; Tales of Passion, Tales of Woe, which was a finalist for the Trillium Award; The Last Great Dance on Earth, as well as two novels set in the court of Louis XIV, the Sun King: The Shadow Queen and Mistress of the Sun. To date, Gulland's novels have been published in nineteen countries and translated into sixteen languages. The Many Lives & Secret Sorrows of Josephine B. was a bestseller in the UK. She divides her time between Ontario and Mexico.